Ten-year data of GRE examinees for international markets is an excellent source of insights to understand changing trends in demand and how sensitive are different markets to external environment. 1. 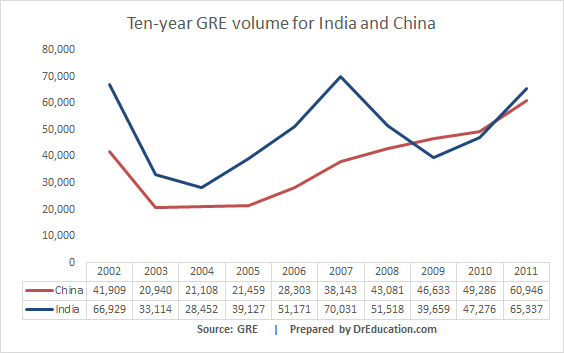 Growth: Number of GRE test takers from India have increased by 38% in 2011 as compared to 24% for China. Even with this growth, India is still lower than its peak volume of 70,000 pre-recession and almost same as its volume in 2002. In contrast, China touched its all time high of nearly 61,000 test-takers in 2011, which is almost 45% higher than 2002 volume. India still has higher growth potential as compared to China. 2. Sensitivity: India is a price-sensitive market which responds more in terms of changes in the external environment. For example, number of test-takers declined sharply during the 2008 global financial crisis. India also recovered faster last year, surpassing China. In contrast, China had been a consistent growth market, indicating a higher purchasing power and lesser sensitivity to financial concerns. These trends should be interpreted in the perspective of the launch of revised GRE in 2011, which expanded the pool of people who used GRE for business school admissions. China is already showing signs of maturing in terms of interest for graduate education in the US. According to recent report from Council of Graduate Studies, final number of applications from China declined by 3% for fall 2013, after three consecutive years of nearly 20% growth. In contrast, India is showing signs of recovery with growth of 22% as compared to single digit growth in previous three years. Going forward, graduate school deans and admissions officers are becoming increasingly curious about future trends. They want to know–Is China growth story for graduate schools over? What will be the impact of steep devaluation of Indian currency and its implication on affordability for Indian students? You Shared Some Data Regarding The GRE takers, Can You Tell Me About The Source Of The Data. I Mean Can I Trust On This data??? According to your GRE numbers on the GRE/GMAT blog post, there were only 28,000 GRE takers in China in 2012. That is less than half of what this blog post shows for 2011. Was there really a 50% drop last year from the year before? As you stated correctly, Indian student enrollment figures in the U.S. have shown great sensitivity to price and employment opportunities in the past years. If that's correct, the increased cost for Indian students (15% + increase of US education cost in local currency during the past month, not counting higher Indian financing costs) should lead to reduced Indian enrollment next year unless offset by stronger employment potential in the U.S. How can U.S. education remain competitive? I see potential for graduate hybrid or online programs to grow their enrollment in India. Innovative graduate schools could open up the opportunity to satisfy partial degree requirements with lower priced online components while living in India. It will be interesting to follow the interest in India in the Georgia Tech/Udacity offer of a highly competitively priced online degree. Large numbers of Chinese students who do their Undergraduate education in the US (much more than the Indians) could stay back in the US for graduate education by taking their GRE in the US. Since this data does not capture nationality but only location related information, these numbers could be misleading to conclude that the Indian market is bigger than the Chinese. While your conclusion about India being a growing and larger market may be true, I look at this from another perspective. China allows US Universities to set up their campuses and also encourages all kinds of collaborations with their local Universities. Thus, Chinese students can get their US degrees in China itself and therefore the number of Chinese wanting to go to the US may come down. Indian, on the other hand, is like a dog-in-the-manger; it does not build its own good Universities, nor does it allow US Universities to set up their campuses or issue their degrees in India and restricts the type of collaborations that they can have locally. So, Indian students fly out in droves to the US to obtain their US graduate degree. This therefore would mean that India will be higher than China in these numbers. Another reason could be the quality of undergraduate education in India that makes Indians want to go to the US for graduate degrees. The quality of undergraduate education is so poor that even the Prime Minister claims that only 25% of them are employable. The general perception in India is that irrespective of the quality of undergraduate education, the students can redeem themselves by going to the US for graduate education; that is why, undergraduate Indian population is lower in the US than the Chinese.